This past Sunday I ran 20 miles and that tipped my weekly mileage in at a total of 47 miles; my highest to date and my max before the NYC Marathon. This was my second 20 mile run. I also ran two 18 milers over the past several weeks. I love the way I feel after running high mileage! Utterly, completely exhausted and fantastically strong all at the same time. This is the course I ran with my amazing Ironman running coach and fellow running-mates from the YMCA. We met at 7am in the parking lot at the Fishing Pier off the South Beach boardwalk with pink and orange sunlight crackling across the NY harbor sky. In the distance was the Verrazano Bridge, Manhattan skyline and the edge of Coney Island with the infamous parachute ride. It was about 50 degrees with a crisp ocean breeze. I have this rule that unless the temperature is under 49 degrees, I will not wear a jacket or long-sleeves for a run. I always end up too hot once I’m settled into a run. For this run I wore a T-shirt and although I felt a chill, I held out from adding a jacket. 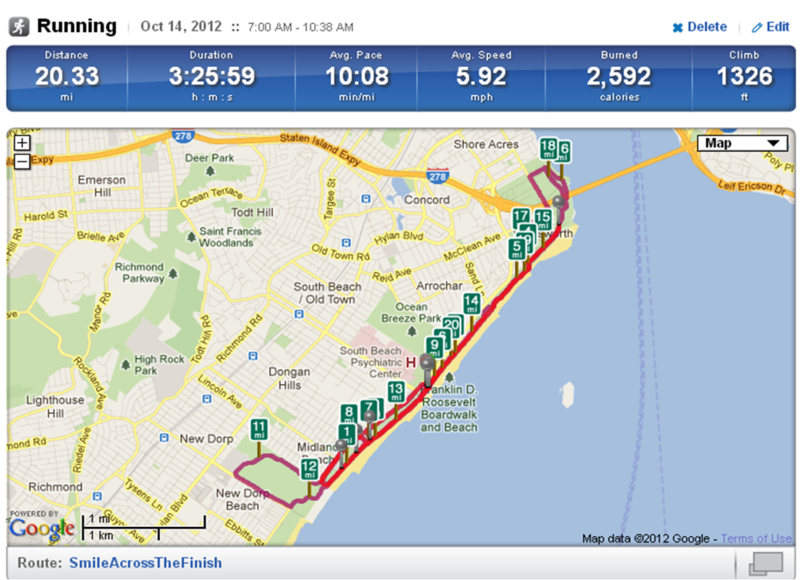 The run our coach mapped out was fairly flat with the exception of when we got into historic Fort Wadsworth. We hit those steep hills for miles 16 – 19 to really test our strength and prep us for the NYC Marathon course. This is one of my favorite courses to run because of the views and the endless paths you can tack onto your route if you want extra mileage. The terrain also switches at different mileage points with boardwalk wooden planks, concrete, paved streets, gravel and grass at various spots. It’s a nice way to strengthen your tired legs as you push into high mileage. There are also public bathrooms and water fountains along the way – an essential for any long-distance runner that isn’t willing (or forced) to rough it in a bush! This is a view of the fishing pier and the Verrazzano Bridge in the distance. Around mile 13 there was a car show setting up in the parking lot and a toy race-car speedway event happening too. We took a 5 minute pause and watched the cars zip and zoom around the mini speedway. So cool! This little guy was especially fast and slick on the turns! When we ran into Fort Wadsworth I was knocked back by this breathtaking, up-close image of the Verrazzano Bridge. I couldn’t help but get emotional thinking this is where I will line-up at the start of the ING NYC Marathon. This is Fort Wadsworth. There are some delightful hills. After our first loop and by around mile 17 we decided to go around again, you know, for good luck. It was tough and it was absolutely awesome. I rarely looked at my Garmin watch to keep track of the mileage and time. I just kept going and going, breathing easy and keeping loose in my mind. As we hit mile 18 we kicked up the gears and I had the stamina and desire to push faster. I imagined myself crossing the finish line in Central Park. I know I will finish the marathon. I know I have the mileage in me. I can’t wait to get started! You are an animal,47 miles in one week is insanity! Good luck and I can’t wait to see the Verrazzano in person on Nov 4th. Enjoy the taper, its almost time!